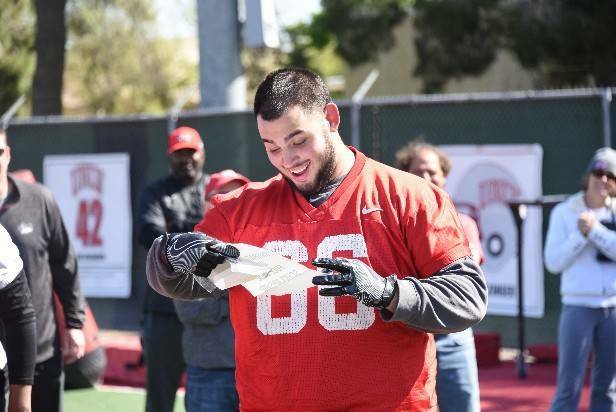 UNLV senior defensive tackle Ammir Aziz was surprised with a football scholarship after Friday’s practice at Rebel Park. He has been working nights as a security guard, but can now commit more time to football. UNLV senior defensive tackle Ammir Aziz reads the envelope informing him of his football scholarship. Photo courtesy of UNLV Athletics. 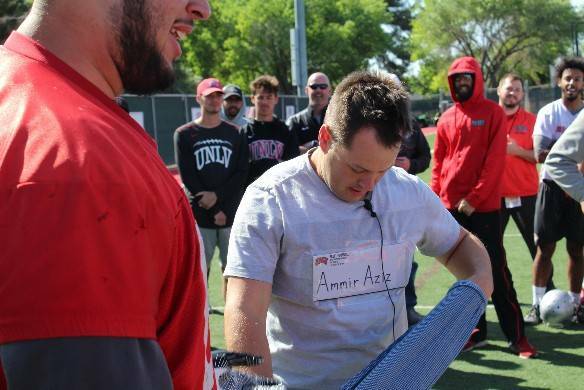 The envelope with UNLV senior defensive tackle Ammir Aziz's scholarship is taped to performer Farrell Dillon's chest. It was part of a ruse to inform Aziz of the news. Photo courtesy of UNLV Athletics. 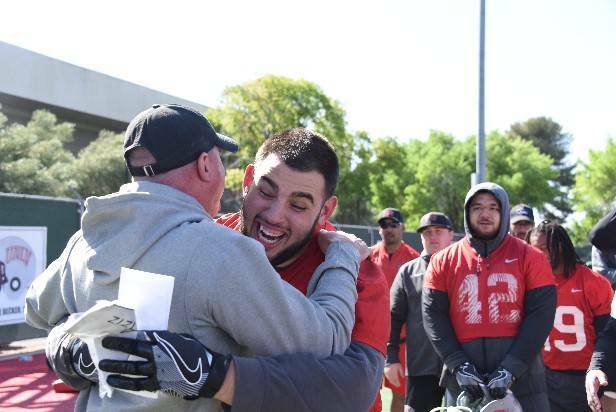 UNLV football coach Tony Sanchez congratulates senior defensive tackle Ammir Aziz on the scholarship. Photo courtesy of UNLV Athletics. UNLV senior defensive tackle Ammir Aziz worked hard for his moment, even if he didn’t see it coming. So when Aziz opened an envelope after Friday morning’s practice at Rebel Park, he was shocked to see he had been awarded a football scholarship. “No way!” Aziz exclaimed before being mobbed by his roaring teammates. It was quite a way to end the next-to-last spring practice of the year. UNLV will play its spring game at noon Saturday at Peter Johann Memorial Field. There is no charge for admission. Schedule posters and magnets will be available when gates open at 11 a.m.
UNLV will play two 25-minute segments, with the starters facing each other in the first part and the reserves also going against each other. The starters will compete against the backups in the second half. Aziz, who went to Durango High School, isn’t expected to be in the rotation at defensive tackle, but he could contribute in other ways, such as on special teams. He was awarded the scholarship for approaching each day as if he was starring on Saturdays. Aziz has worked as an overnight security guard for the MGM Grand and would get off his shift and arrive at campus in time for the 7 a.m. team meeting. He would stand to make sure he was awake and alert. UNLV coaches didn’t simply hand Aziz the envelope. They brought in Farrell Dillon, who performs in the “Masters of Illusion” show at Bally’s, to involve Aziz in an act in which Dillon had to get out of a straitjacket while balancing on a skateboard over a cylinder. After Dillon freed himself, he asked Aziz to remove the envelope that was attached to the performer’s chest.